Affinity Water, in partnership with Yorkshire Water, hosted the water industry’s first ‘Industrial Cadets Week’ earlier in November. The Industrial Cadets initiative is an accredited work experience programme for young people supported by the Engineering Development Trust (EDT). 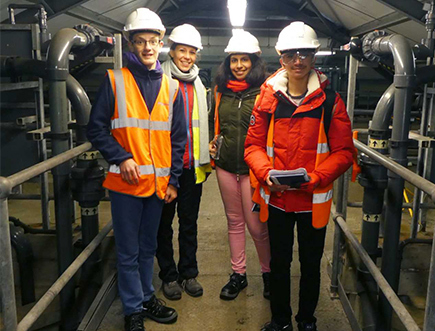 Around 22 students aged 14-18 took part in the week-long programme to understand how the UK water industry works, what skills and professions are needed and the challenges the industry faces. Led by Affinity Water’s Education team, the week was action packed and saw the students meet with different departments from across the business, ranging from the finance and legal teams to leakage, catchment management and GIS teams. The students learnt how some of their school-based subjects, particularly Science, Technology, Engineering and Maths, are applied in Affinity Water’s daily operations to ensure customers are supplied with high quality water every single day. Students visited a number of operational sites, took part in team building activities and mock interviews and also learnt about the importance of employability and communication skills. The students gained a nationally accredited silver level award by applying what they had learnt and completing a short project to address a real problem faced by the UK water industry - focused on water conservation. The last day concluded with the students presenting their project findings to Affinity Water’s Chief Executive Officer, Pauline Walsh and Board Chairman Tony Cocker. Hannah Battram, Affinity Water Education Services Manager added: “It's so important to be able to show case the amazing work that our teams do every day, highlight the range of skills involved within the industry and help young people understand what it takes to get clean drinking water to our taps every day. One of the student’s parents who took part commented: "I’m very impressed by the content that was covered, the participation of the staff involved and the motivation it has given my daughter. I think it’s important for her to see that there are many industries and types of engineering careers out there. I especially impress upon her that many women are pushing the boundaries and have forged amazing careers in all types of engineering fields and that she too could also do so if she so wishes. With this in mind, she was very excited to learn of Affinity Water’s CEO, Pauline Walsh who left a very good impression on my daughter. The course has really ignited her passion and I can’t thank Affinity Water enough for that."